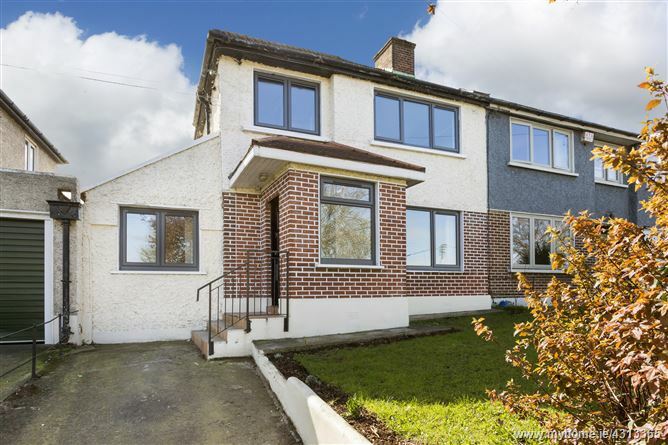 Mason Estates present this fine extended four bedroom home with attic conversion and bright spacious accommodation situated within a stroll of the Botanic Gardens, the Bons Secours Hospital and all that Glasnevin has to offer. Accommodation briefly consists of a storm porch leading to an entrance hall, a sitting room, dining room, kitchen, living room, back hall/utility giving access to a guest w.c. and office to the rear There is also a bedroom/playroom to the front with guest shower room off it downstairs. Upstairs there are four bedrooms (main with en-suite) and a bathroom and stairs leading to a spacious attic room. The property has the benefit of newly fitted double glazed uPVC windows, gas fired central heating, and bright spacious extended accommodation. The property oozes potential to add your own flair and design with a large private rear garden which is south facing and a drive in to the front. Timber floor, under stairs storage. Timber flooring, ceiling coving and centre rose, archway to . . . Timber flooring, patio door to rear garden.